Keith Bedford/BloombergDov Charney, the embattled CEO of American Apparel Inc., on June 18 was unceremoniously ousted from the clothing retailer he founded in 1997. The long leash is tightening on chief executives — especially those charismatic founders whose drive and influence have made them seemingly untouchable. 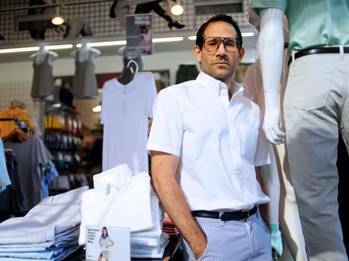 That’s the lesson of Dov Charney, the embattled CEO of American Apparel Inc., who on June 18 was unceremoniously ousted from the clothing retailer he founded in 1997, over a range of concerns tied to his personal and corporate activities. Shocked, the controversial 45-year-old refused to resign as CEO and president and hours later was stripped of his chairmanship by some of the same directors he brought onto the company’s board. Not surprisingly, Mr. Charney, American Apparel’s largest shareholder with a 27% stake, is fighting back, according to a regulatory filing with the Securities and Exchange Commission, and is said to be preparing a wrongful-dismissal lawsuit against the company. How did it get to this acrimonious point? Keep in mind, this is the same guy who has as many as eight workplace sexual-harassment and abusive-behaviour cases filed against him in recent years, who strolled factory floors of the hipster-clothing company in his underwear, and was videotaped dancing naked in front of female employees — and yet he stayed in his job. The once-thriving retailer’s balance sheet has been on a roller coaster for years, plagued by weak sales and growing debt. It has flirted with bankruptcy and a threat of being delisted by the New York Stock Exchange, while criticisms of lax financial controls swirled. Still, Mr. Charney managed to stay on top. So what suddenly caused the board of directors who had benevolently tolerated the misconduct of the “pants-optional” CEO of the $120-million enterprise to now view him as a liability? “Some charismatic, dominant people have demons and have reputational issues that can be their undoing,” explained Richard LeBlanc, associate professor at York University, who also teaches governance at Harvard University. 1. Expense-account irregularities will ruin you faster than even the most perverse personal behaviour. An internal investigation into Mr. Charney’s activities, launched by the company’s board in March, claimed he used corporate funds to book airline tickets for his mother (who is retained by the company as a design contributor) and that he and his friends used apartments owned by American Apparel for personal reasons. The report also claimed that Mr. Charney aided in the creation of a blog displaying naked photos of a former saleswoman who filed a US$260-million lawsuit against him and the company for sexual harassment in 2011. According to a report from Reuters, Mr. Charney’s alleged knowledge of the blog, and his failure to stop it, prompted the internal investigation that led to his termination. Clearly, allegations of misusing corporate assets could do what Mr. Charney’s naked dancing and spotty financial track record could not. 2. Rogue founders beware: It’s all about the reputation of the company and its board of directors. While the folks who create companies have generally enjoyed endless goodwill and deference because of their impact on management and board selection, it’s now becoming easier to part ways with a founder. Why? Boards are less forgiving of breaches of the company’s reputation and of senior executives who create an unhealthy distraction for companies. A founder gone rogue is dangerous because the reputation of a company is intertwined with the personality. In the case of American Apparel, the harassment suits were bad enough, but some directors became uneasy with the way Mr. Charney was responding. That, coupled with the adverse publicity surrounding the CEO and its effect on the firm’s thousands of employees, made him expendable. 3. Not doing something is not an option. Activist boards are filled with fair-weather friends, no matter who put them in their seat at the boardroom table. It used to be that CEOs were judged almost entirely based on the health of the balance sheet, and boards were willing to turn a blind eye to a CEO’s extra-curricular activities. However, the pressure and personal liability of directors has grown so immense that most have far less tolerance for missteps that are coupled with lousy financial results. Witness how Mr. Charney’s attempts to round up directors to his cause have so far been met with deafening silence. 4. Nothing is private anymore. The zone of privacy for senior executives is very small. Everything they say and do is now fodder for social media and executives are warned to expect to be taped even in private meetings. For entrepreneurial types who don’t tend to be circumspect, the new transparency can be their undoing. 5. The spoils may not come to those who wait. It is curious that the board at American Apparel waited almost a decade to challenge Mr. Charney’s leadership. That may pose a problem if the ousted CEO makes good on his legal threat. By letting his questionable conduct go unchallenged for so long, Mr. Charney can argue the board indulged the very activity for which he is now being terminated, and in doing so, tacitly consented to it.